Today’s dish is a super easy one that you can easily alter to your own tastes. This was somewhat inspired by a Weight Watchers Recipe, but we changed it quite a bit. In fact, today’s post is more about a meal idea than a specific recipe. The original recipe isn’t for kebabs, but simply grilled chicken breasts and sausage links. We decided to liven it up a little by cutting up the chicken and sausage and skewering it along with some corn, bell peppers, and zucchini. 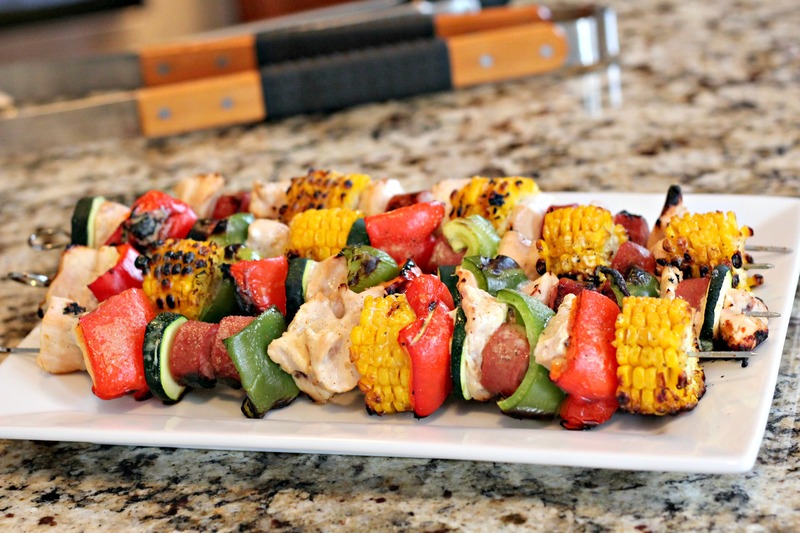 You of course do not have to use these veggies and meats, you can put whatever you want on your skewers! You could have an all meat or an all veggie skewer, if you like. This is a perfect summer meal. You don’t have to heat up the kitchen with the oven and it’s ready in minutes. It does help to plan ahead and marinate your chicken so it has more flavor. But other than that step, this dish takes only about 30 minutes total to prepare and cook. Here is the original recipe that inspired this dish. Feel free to either follow it exactly or turn it into something different that matches your tastes! Combine chicken breast & dressing. Marinate in fridge at least 1 hour. Remove chicken from marinade, and place on grill with sausage. Grill until done, about 10 minutes per side or longer if chicken is thick.